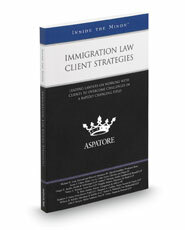 This product provides an authoritative, insider's perspective on understanding client goals and achieving the best possible outcome for both corporate and individual clients in immigration matters. It discusses how to manage expectations, develop client relationships, and plan strategically despite changes in the complex landscape of immigration regulation. It gives tips on interactions with business executives and HR departments to successfully develop an immigration strategy that meets the company's goals. It also discusses dual representation issues and family- and advocacy-based immigration.